I love small intimate lunches where you can watch each dish being lovingly prepared by the Chef while you relax with fellow minded foodies. Chefs are usually hidden in their kitchens and one does not get to interact with them. As a foodie I am passionate about knowing what I am eating and about the people behind the place where I am eating. I search for information before I visit places in order to gain a better insight into the upcoming experience. The more information I am given – the happier I am! So let me share a new gem with you. It ticks all my happy boxes – you get to chat to the Chef as she introduces each course, you hear where the ingredients are from and that she grows her own vegetables & herbs, that she goes foraging in the forests and sand dunes around her, that she is buying her fish from the local fishermen and that she is sourcing as much as humanly possible from her front door step. She has called her home dining experience with a Chef – Crofter’s Kitchen. 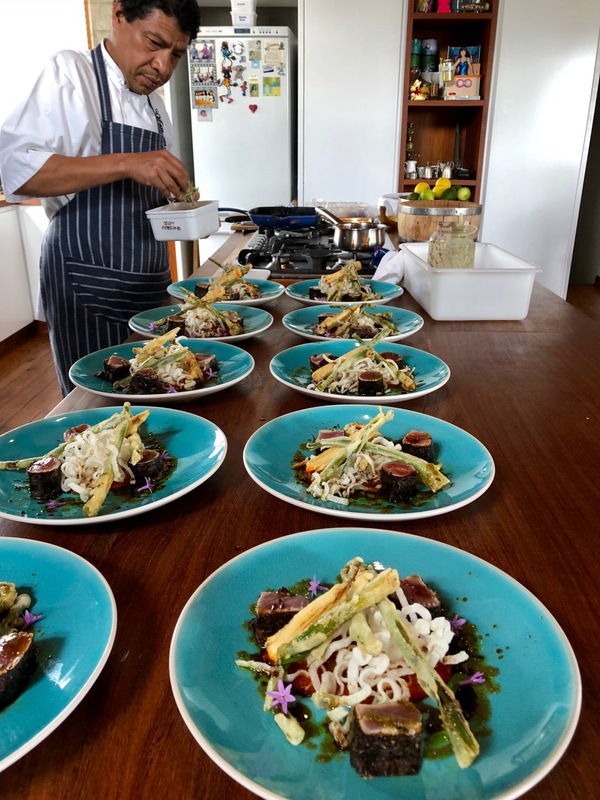 Chef Nicky Gibbs has opened her home in Noordhoek on the Cape Peninsula to allow a maximum of 14 people to join her for lunch each day (Monday to Friday). Here you relax and start with a welcome home made kombucha while you enjoy the view and a snack while enjoying the view over Noordhoek with Noordhoek Beach in the distance. 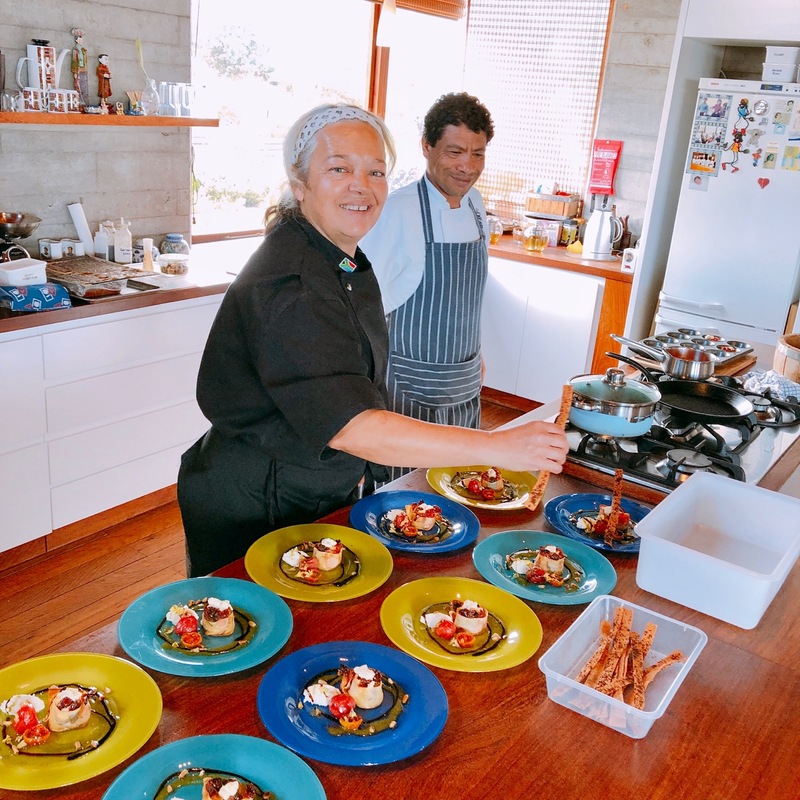 Once you are seated the 5 course journey starts – you watch as Nicky and her fellow Chef prep and plate all the dishes in front of you. Her concept is to pair each dish with a matching tea. I loved the teas – and I am not a tea drinker! 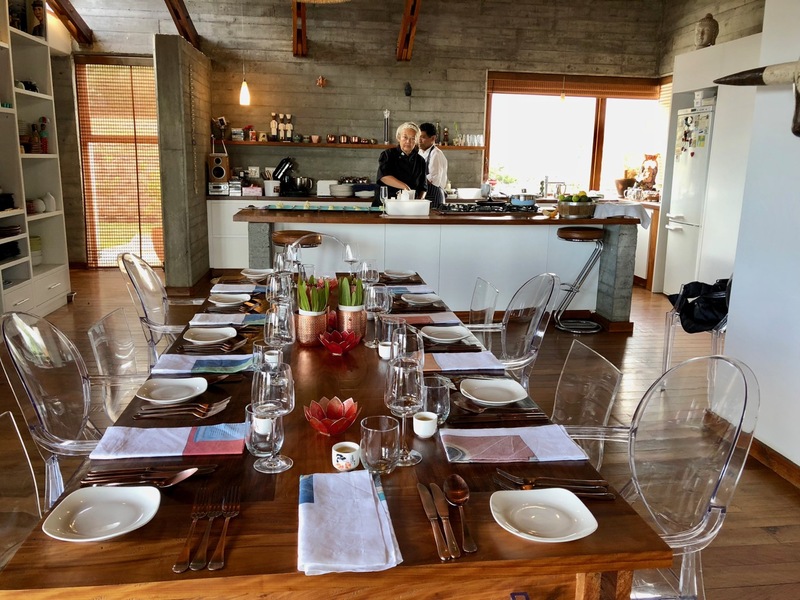 Last year I wrote about the launch of the Foodbarn Studio – this was the joint venture between Chef Frank of The Foodbarn (one of South Africa’s top Chefs) and Chef Nicky. 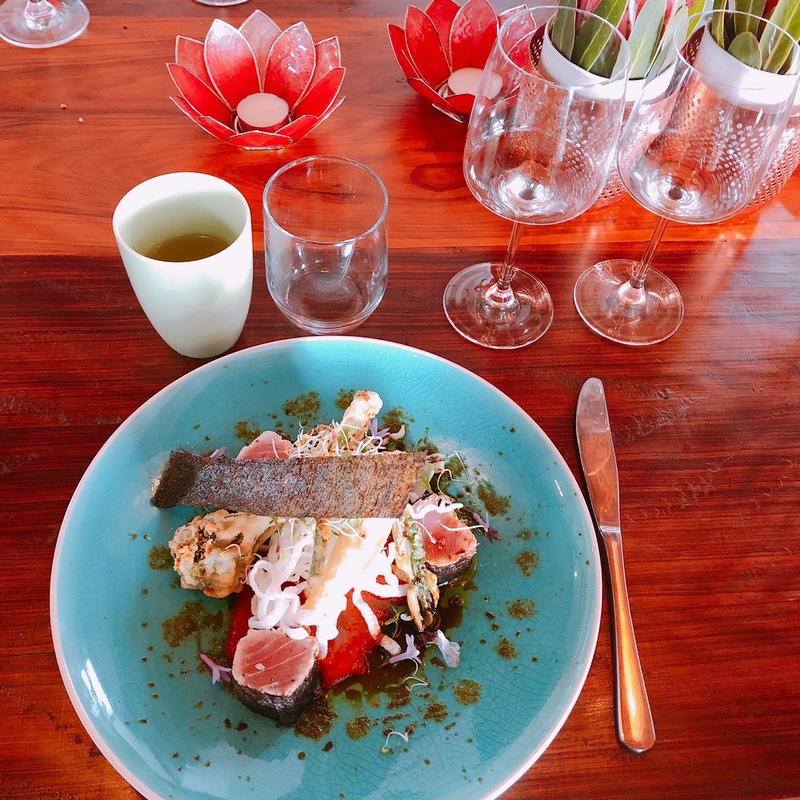 They launched a home dining experience in Chef Nicky’s home for 25 people. The venture however ran into trouble as they were not granted a liquor license. As such the Foodbarn Studio closed its doors. The new venture – Crofter’s Kitchen is the sole venture of Chef Nicky and is a far more intimate affair as it is limited to 14 people. Chef Nicki Gibbs is a rock star Chef – literally! She has traveled the world as a private Chef to famous bands such as the Rolling Stones and the Red Hot Chilli Peppers. Finally she is putting down her roots in one spot and has decided to settle down in the Cape and share her culinary delights with us everyday folk! 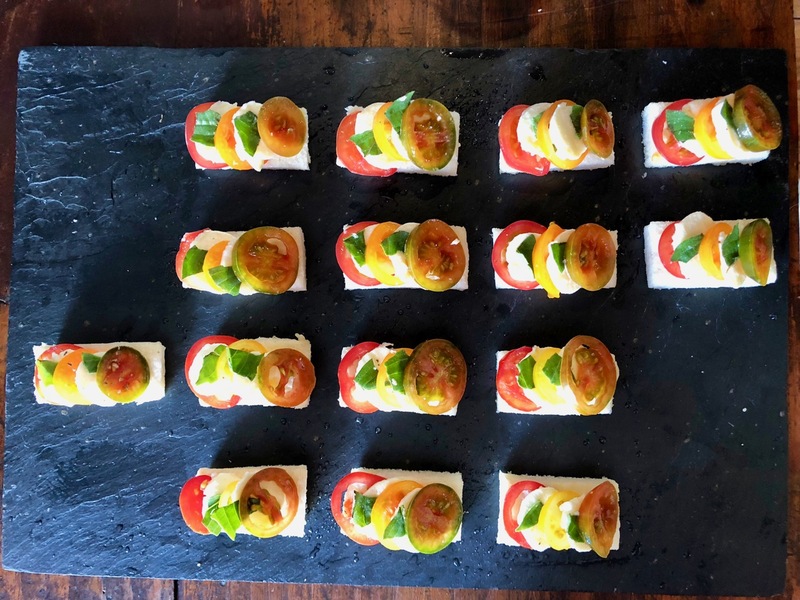 Garden harvested tomatoes served with Pepe cheese – from the local cheese maker down the road! 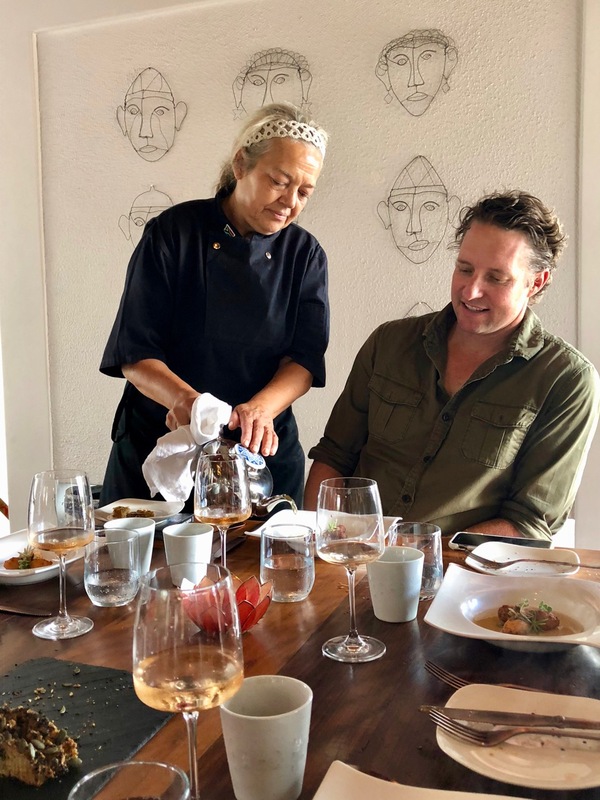 Chef Nicky serving tea to pair with her porcini broth – which was garnished with “fynbos” vegetation from her garden. The porcini’s came from Plettenberg Bay. Plating the fresh tuna dish – which was bought that morning on the peninsula. Beautiful plating and beautiful plates for each course! 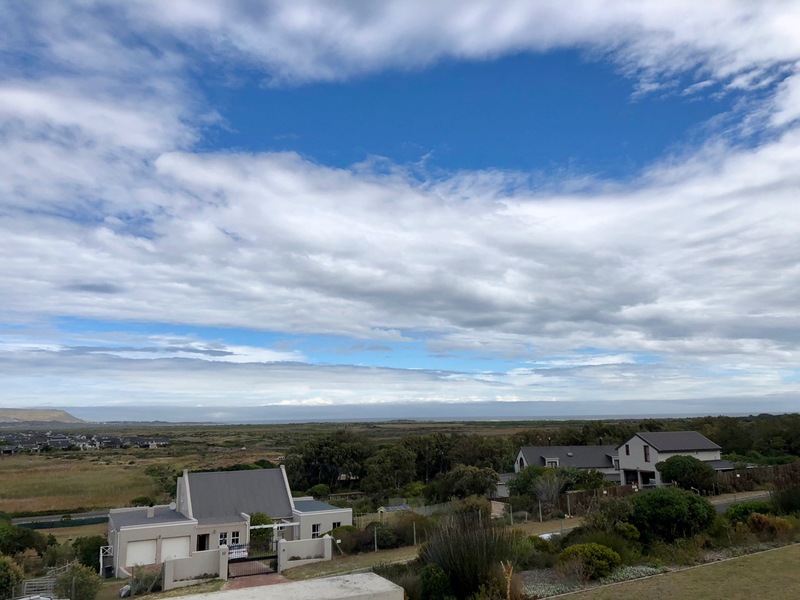 The view of Noordhoek from Chef Nicky’s home – we visited on a cloudy day! 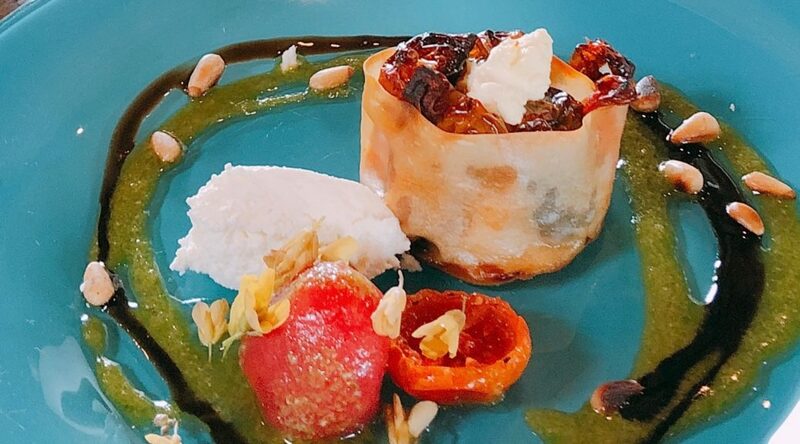 Chef Nicky clearly has a sweet tooth – her dessert was sublime!! I was invited to come and try out the new Crofter’s Kitchen. I loved it! I loved how wonderfully down to earth Chef Nicky is. She is wonderfully laid back and relaxed and an extremely passionate Chef. I loved the intimacy of the experience. 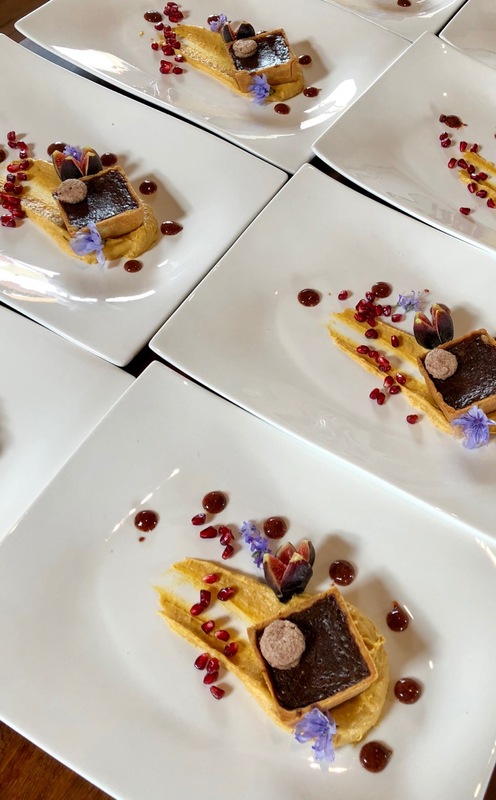 One could either sit back and learn about each dish when she popped out of the kitchen to introduce each course or you could chat to her in the kitchen as she plated each dish. 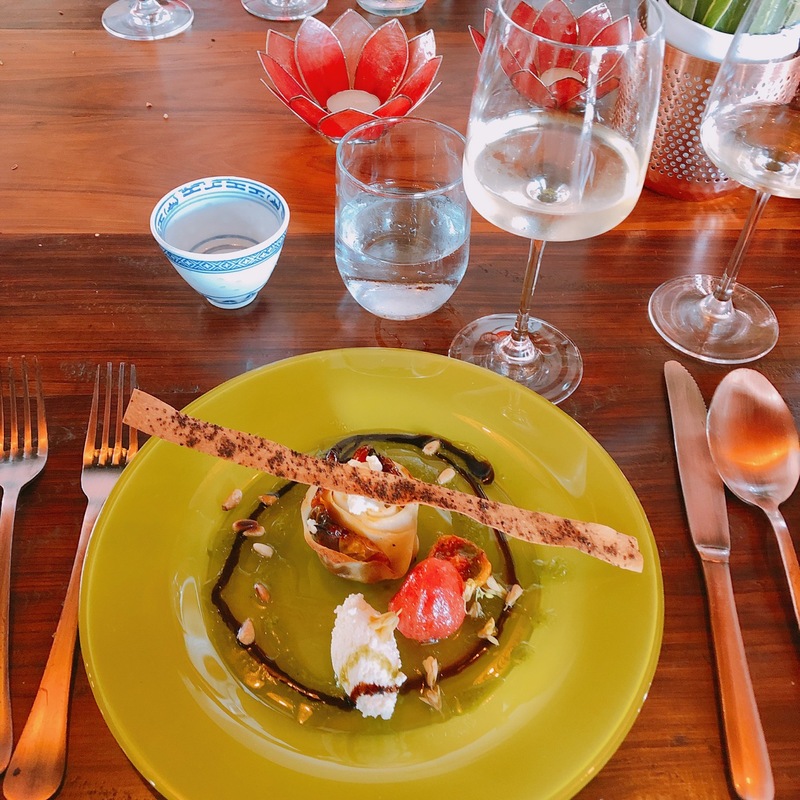 I think as foodies it is wonderful to be able to really know where each element on the plate comes from and to understand the philosophy of the chef. I love passion and I am infected when I see someone loving what they do! Chef Nicky’s passion is infectious! I loved the tea – but I love wine more – so I would strongly recommend you take a few bottles of wine with you! Chef Nicky recommends rose as it pairs with most of her dishes! 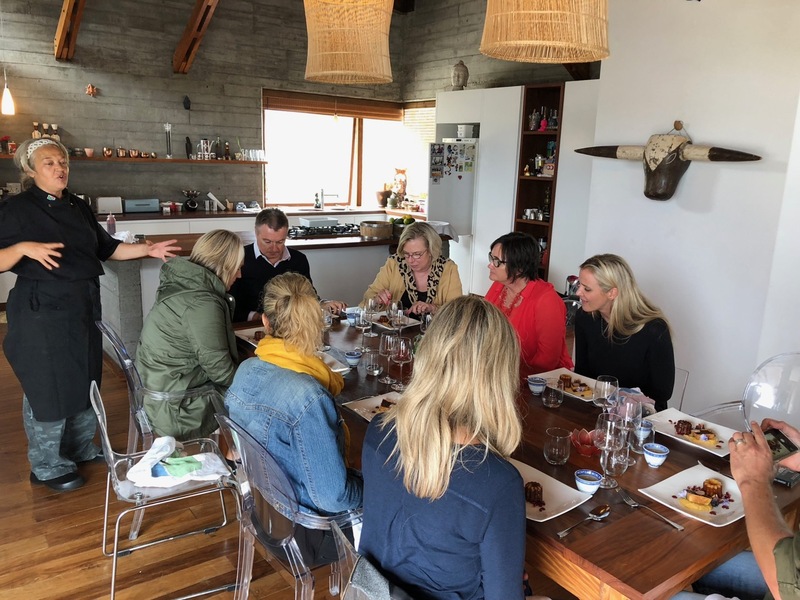 We would recommend that you combine doing lunch at Crofter’s Kitchen with our relaxed peninsula tour. That way we can do all of our activity in the morning and then relax to a long wonderful foodie lunch experience on the peninsula! Alternatively if you are self driving – make sure you leave early in the morning and do Cape Point and the penguins early – that way you will be able to make it to lunch! Open for lunch Monday to Friday and Brunch on Saturday. Note – you can book a private lunch with Chef Nicky and she will develop the food to your brief. This would be fabulous for a birthday with friends as you can book out the whole table of 16! R765 per person – must be pre-paid. The cost is for 5 courses paired with 5 teas. It excludes gratuity. You are welcome to bring your own wine along for lunch – the Chef recommends rose for her food pairing. Tip – stop at Cape Point Vineyards and stock up on the way!